Physics has a problem. In fact quite a few problems. Why are there three generations of fundamental particles, each seemingly just a heavier copy of the generation before? What is dark matter? Why is the expansion of the universe accelerating? 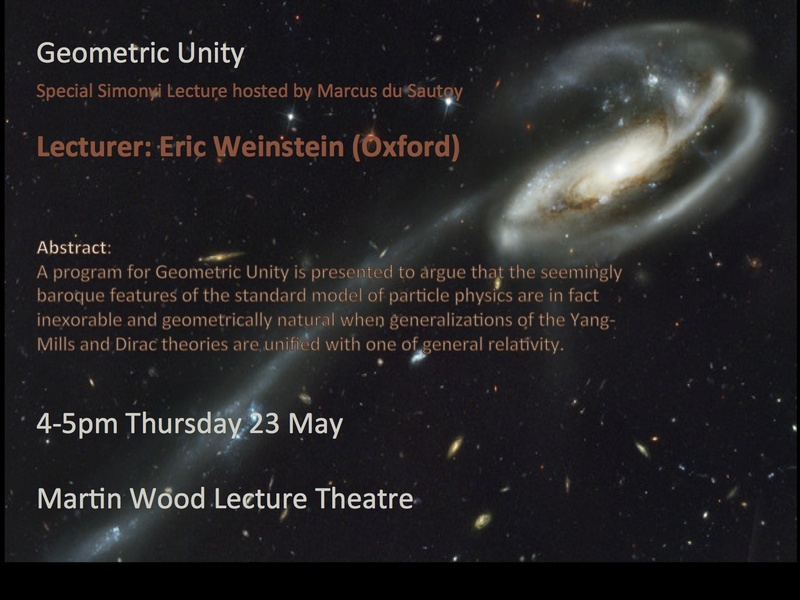 How can one reconcile Einstein’s Field Equations which control the curvature of space time and represent our theory of gravity with the Yang-Mills equations and the Dirac equation which represent our theory of particle interactions on a quantum level? Two years ago Eric Weinstein, working from outside the academic system, came to me with some bold and unorthodox ideas that he had come up with as an attempt to answer these problems. My initial reaction to this was the same as to any such proposal of this type: skepticism. Like many academics I regularly receive hundreds of emails, letters, books from a whole range of people claiming the discovery of a theory of everything or proofs of the Riemann Hypothesis or the Goldbach Conjecture. However I have always kept in the back of my mind the story of Ramanujan writing out of the blue to GH Hardy. Ramanujan’s approaches had been rejected by two academics in London before Hardy responded positively to his letters. So I try to give serious proposals a hearing regardless of whether they come from inside or outside the academy. My initial skepticism began to wane though as I heard Weinstein’s ideas unfold. By the end of our meeting I was intrigued enough to dedicate time during the last two years to work through the ideas. I don’t understand every detail, but the ideas are beautiful and I believe extremely natural. It is a highly mathematical story but with clear implications to questions of physics. His approach is in line with Einstein’s belief in the power of mathematical geometry. Einstein talked about his conviction that the universe was made of marble not wood. Weinstein’s proposal which he calls Geometric Unity realizes Einstein’s dream. Geometric elegance is of course no guarantee that the mathematical universe that Weinstein describes must match the reality of our universe. However, if the details survive scrutiny it will still be a beautiful mathematical landscape Weinstein has uncovered, as well as one with uncanny similarities to the world we inhabit. Weinstein has kept many of these ideas to himself for nearly three decades. It took some courage for him to discuss the ideas with me. I was sworn to secrecy. Weinstein has also been discussing the ideas in secret with mathematician Ed Frenkel and physicist David Kaplan. But as I spent time with the ideas I believed that they were too important to be kept private and needed to be discussed more broadly. It was in the spirit of this part of my mission as the Simonyi professor that I decided to persuade Weinstein to give a special lecture in which he could start to propose the ideas he has been working on. The decision to try to publicise his ideas was not taken lightly as all attempts at a Unified Theory have failed so far. However, a little thought reveals that whenever a final theory is at last found, it will first begin its public life with an overwhelming statistical likelihood of failure. As Charles Simonyi suggested let me make very clear how the scientific method can work. If you have new ideas it is perfectly acceptable to try to articulate these ideas through a seminar or lecture before publishing a paper. The ideas might go through some revision and evolve through dialogue with other scientists. Ultimately these ideas must be written down and evaluated by the communities to which they are relevant. The lecture that Weinstein gave last week was the beginning of that process. A paper which Weinstein is currently working on will in due course appear. As Charles Simonyi expressed in his manifesto “scientific speculation can be very exciting”. It is an excitement that I think the public can share. No one other than the relevant scientific communities will be able to evaluate the merit of the work, but why shouldn’t the public see science in action? It can help communicate the challenging problems that physics still faces. It took a lot of courage for Weinstein to come forward and talk about his ideas. He comes as something of an outsider but with the sensibilities and knowledge of an insider, a difficult place from which to propose bold ideas. He has a PhD from Harvard, post-doctoral experience from MIT and the Hebrew University. Not a bad grounding. But rather than staying in academia he went a more independent route working in economics, government and finance. But I have always been a believer that it doesn’t matter who the person is and what is their background, it is the ideas that speak for themselves. I believe science has much to gain if the ideas turn out to be correct and little to lose if they turn out to be wrong.